This is a heavy duty standard solid steel weight lifting squat rack for barbell. The Barbell Stands are adjustable to fit each person's height. H frame bases allow a stable stance while in use. Safety catch bars available for emergency needs. Rubber end caps protect the floor from scratches. 6. Suitable for benching, leg stretching and deep squat etc. Solid Construction: The power rack is made of thickened and high-hardness steel material that provides the maximum safety and max load: 390 lbs. It also provides adjustable spotters on each post that ensure your safety. This squat rack is solid and durable to use. Easy Assembly: Assembly process is very simple. Kindly noted: This product does not include the installation tool, you need to prepare tools and installation. Adjustable Height: The height is adjustable from approximately 40.55 inch to 66.14 inch. What's more, it has 13 adjustable levels for free choice. This is great squat stand for deep squatting, benching, leg stretching etc. 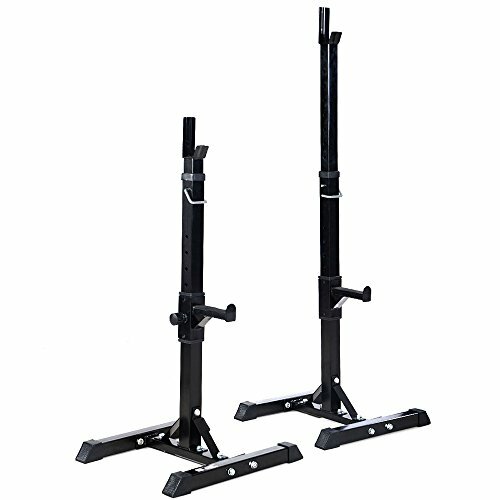 Rubber end caps Design: This barbell rack squat features non-slip and abrasion-resistant rubber feet, which firmly position the Squat Rack and to prevent damage to the floor injured joints. Top Customer Care: We always stand behind our crossfit power rack. One-year warranty: Our warranty is ironclad and truly hassle free. If our product does not meet or exceed your expectations, please feel free to contact us.